While it tends to spawn the pseudoscientific, much more than it tends to be involved in its propagation, is that people tend to make up explanations for things and try to understand the natural world on their terms. Even when there is a scientific or rational explanation, if its immediately unexplainable, the imagination may run wild with explanations or look for something similar to explain it. A good way to put a face on this specifically would be the legend of The Flying Dutchman. This legend originates from South Africa especially around The Cape of Good Hope. This isn't the only legend of a ghost ship that seems to travel on the skies and can never make port. It is the most well known. People would report seeing a ghostly-looking ship, that might even seem to float on the skies or be well larger than any ship could be at that time. In the picture there is a painting at the top of this particular ghost ship. Looking at the horizon off the shore or from the side of a ship and seeing a ship cresting seemingly on the clouds, it is not hard to imagine being quite shocked. It is easy to see why one might think of it as a ghost ship. There is a far more realistic explanation while not immediately attainable, a type of visual distortion or mirage known as Fata Morgana is the most likely culprit. 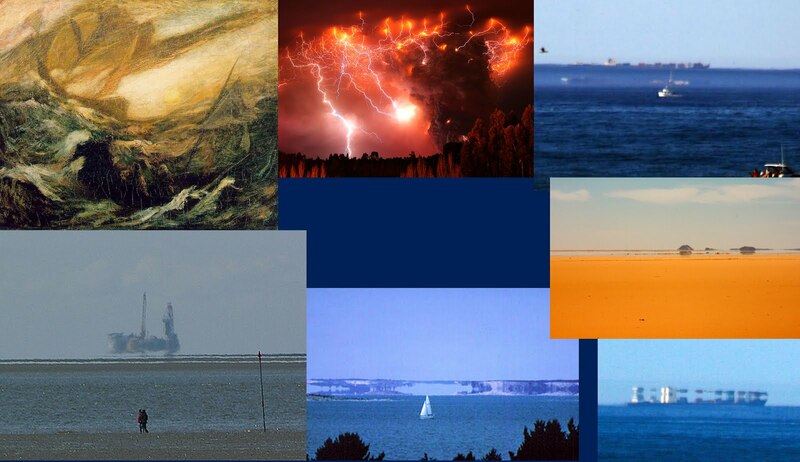 At top there are several examples of such effects on the sea and even one on the desert. Clearly one might see something else when witnessing this type of effect especially if already prone to superstition as many sailors were and still tend to be. It is even easy to draw some parallels between the painting and the several pictures at top. People would see these optical illusions and retell the anecdote attaching it to whatever prevailing myth of a ghost ship was common to that particular local. Simple superstition and imagination might reinforce the belief some one had witnessed supernatural or paranormal phenomenon, even though a simpler explanation could ultimately prevail. At the top, I have also included a picture of the recent volcano eruption in Chile. While it physically and scientifically may make sense, such an awesome image would remain on someone's mind. To look at it from another stand point, people would want to explain it, even though they might lack any appropriate technology. The more creative would make up stories, and these stories would be reinforced over time socially by being told to children and expanded upon. Eventually to mitigate the fact how afraid people are of the volcano, they might even attempt to appease it by making offerings to it. This is important to remember as often the people, who are selling pseudoscientific theories and products, are often taking advantage of, and even doing harm to, people in bad situations. These people may never realize, or even be able to do the research, to know they have been taken in before it is too late. It is extremely important to always be on the look out for such non-sense, before it goes to far.